I have a question......since I posted earlier on the thread about my medical issues, the natural and homeopathic stuff has made an almost unbelievably huge difference in three weeks. While I'm still waiting for my blood results for my thyroid function, my symptoms are almost gone.I literally haven't felt this good in YEARS! Due to my low energy earlier, I did very little other than say a quick prayer to Dr. Hernandez here and there asking him to help...no candle, no vigil, no nothing. Could he still have been behind this? I most certainly want to thank him if it's possible that he guided me to the right suppliments to help me and is keeping me strong in cutting things out of my life and diet that were hurting me and I didn't even know it. And when I do thank him, other than honest prayers of thanks for his help and intervention in my life, what is appropriate? Some times prayer is enough to get the help from a saint. Since we are not going to be able to accurately tell you if he was the one that helped you, I would get a 10 minute reading and see if thats is the case. When I thanked Dr. Hernandez, I made a donation in his honor to St. Jude's hospital (I know it was named after St. Jude, but I kept being drawing to this hospital and I know they perform miracles for children), or another hospital type of charity that help those with medical care. "When a saint grants your wish, it is customary, to give an offering of some kind in return. 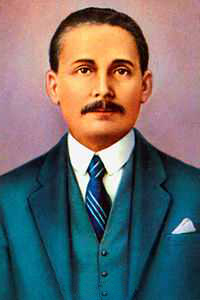 Because Dr. Jose Gregorio Hernandez, the servant of God, was a humble man, and was personally involved with the distribution of medical charity to the poor, it is a beautiful thank-offering to him to quietly contribute money for the relief of the suffering of others, especially those who cannot easily afford medical care. Such an offering of charity, rather than flowers or the magnification of his name, is what this saint-to-be prefers, and in keeping with his own manner of living, such works should not boasted upon, but all gifts distributed in his name should be given with humility and a loving, kindly heart." Thanks Star, I might have to invest in the 10-minute reading after payday. And the idea of a donation to Doctors Without Borders came to me when I was reading about him. I'd like to testify that San Gregorio not only got me into medical school, but actually helped guide me down the path of becoming a physician in the first place! I discovered Dr Hernandez many years ago while I was working in a medical library, and his spirit really spoke to me, even though I wasn't fully sure why. I figured that since I worked at a medical school, it made sense that I would feel drawn to the patron saint of medical students, and I simply accepted it at that. I kept a small statue of him on my desk at work, and every time I saw him, he gave me a sense of peace as well as a sense of purpose. I didn't know at the time what my purpose was -- I had no interest in becoming a doctor, and was at the time actually considering graduate study in the library sciences! Still, I enjoyed the good doctor's presence with me and continued to search for my path. Long story short, about a year later, an illness in my family opened my eyes to the beauty, satisfaction, and wonder that can be found in a physician's work. Now, several years later, I'm a fourth year medical student, and San Gregorio is still guiding me on my path! In fact, he and San Lazaro have both given me many blessings in work I do with the mentally ill.
Dr Hernandez is full of warmth and kindness, and he will certainly help you in helping those in need! I wish you many blessings on your path. Thanks to Dr Hernandez, who helped me to succeed in my microbiology course and get good exam marks; thanks also for helping me get a medical microbiology research placement over the summer. I am truly grateful, Dr Hernandez. I am very grateful for these posts. 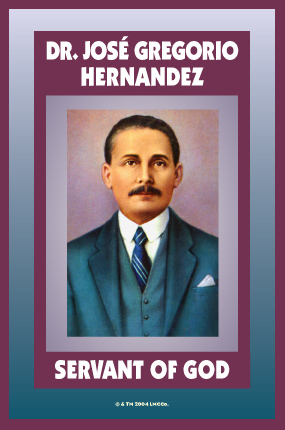 I learned about Dr. Hernandez this past summer and have peitioned his intercession with great success. Thank you Blessed Dr. Hernandez for my health. Thank you again for the healing that continues with my friend. We are both grateful for your continued assistance and will continue to Honor You and be thankful and giving. Is it too late to thank Dr. Jose Gregorio Hernandez?!? And if it's not, what's the best way to thank him now that all this time has elapsed? I ask because almost two years ago I had LM burn a Dr. Hernandez candle for me on the recommendation of Miss Cat (we had just done a reading). I have had a *major* intractable illness for almost 8 years. I have been to more doctors and specialists than you could ever imagine. Almost from the time I got sick, doctors were mystified by my condition. Even after I got a diagnoses, I was told there was no cure. Honestly I forgot about that candle pretty soon after I had LM light it for me. About 8 months passed without event. Then, after an especially desperate + fruitless phase of online searching, I came across some critical information. This information lead to a correspondence with a foreign facility of specialists that deals with hard-to-treat, intractable cases like mine. At the head of this outfit is a brilliant woman microbiologist. But you have to realize that by this point I had just forgotten about the candle. It had been a while. When I did remember I thought too much time had elapsed for Dr. Hernandez to have been a part of my mini miracle. Only because I thought that if you didn't see signs in 3 months, then it wasn't going to work. Which was stupid thinking on my part, I know. So basically I'm still working with these doctors. I'm not all the way there but I did have a big breakthrough with them. I'm going back to get treatment with them again in the spring. And I want to find the best way to thank Dr. Hernandez for my past (recent) success and find a way to keep working with him again. In the spring. Thanks all and sorry this was long! I would suggest maybe donating money to an organization that helps the poor get medical attention or something that you feel is right that pertains to the medical field. Maybe light a white candle in honor of him also and a published thank you.. I am no expert, just offering my opinion. Best of luck and congratulations on your breakthrough. I hope and pray you get all of the healing you need. Take Care. I've made donations to Drs Without Borders and the Red Cross as a gesture of thanks for the help Dr. Hernandez has given me and those I've prayed to him for as well. But I think any group that helps people receive health care they couldn't normally afford would be appropriate. thank you so much for hearing my prayer/petition just last night ! I dont have health insurance so i needed to visit a low cost clinic at 6 am this morning, most of the time the doctors and staff are so over worked that they have no time to listen and sometimes it feels they dont care, though i know they do . the physician Dr.Hernandez led me to was so helpful, caring and informed with my condition. xrays were ordered right away and the proper meds prescribed, i was even given a glucometer for free ( they are expensive). thank you Dr. Hernandez ! i have also made a donation to a charity that operates on cleft palates for young children in third world countries at no cost to the families. For the last two years, I have had an undiagnosed condition. I have been to many doctors and have taken several tests but each time the test comes out normal. I have also tried alternative medicine like Chinese medicine with no success. I was recommended by a Conjure Root worker to petition Dr. Jose Hernandez to help guide me to the right doctor. I wanted to know has anyone ever petitioned Dr. Jose Hernandez? Is there another thread that explains how to petition someone because I am very new to sort of thing. Here is the thread you are looking for. Dr. Jose Gregorio Hernandez has always come through for me - I'm sure he will aid you as well. There is a lot of good information on the thread you gave me. I know I will have to reread it a few times but this is a good start for me to begin my petition to Dr. Hernandez. Is there a specific candle and oil I should buy from the Lucky Mojo Store so I can petition Dr. Hernandez? LM carries both the candle and the oil for Dr. Jose Gregorio Hernandez, as well as statues, bath crystals, sachet powders, and incense. They can be used for petitioning him. This is a wonderful service that Lucky Mojo provides. So I finally got my supplies (Dr. Hernandez card, oil , and candle). For the oil, am I suppose to apply the oil on my body before praying, or after taking a shower? I am not sure how to use the oil with the praying. Dynamitek...I can only speak for myself, but when I pray to Dr Hernandez I use the oil to anoint the altar candle I have going on his altar at all times, and to anoint the petition papers I have under his statue. I personally don't anoint myself, but I'm sure there are people who do. In my case I'm asking for help with a long term problem or I'm asking for help for people who are not in my home (hence the petition papers), so actually anointing what needs healing isn't always possible. He is a wonderful Saint and I feel very blessed to have had his help in my life. I asked Missionary Independent Spiritual CHurch to light a candle to Dr. Hernandez for my mother's illness. He came through for her in an amazing and most unexpected way, so to say thank you to him I made a donation to a medical charity for the poor as the LM page on him advised to do. Thank you, Dr. Hernandez. I am glad that he came through for you and your mother. He is a great healer indeed. Thank you dear Saint Dr.Jose Gregorio Hernandez. As our first time working together it was a true pleasure and I appreciate your healing. Thank you Dr. Jose Gregorio Hernandez, Saint Raphael, Saint Anthony and Saint Jude for your intervention and healing me of my TMJD. Thank you DR. JOSE GREGORIO HERNANDEZ. 1) To "petition" a saint (in this case J. G. Hernandez) is it enough just to burn their candle? 3. Can I use attraction oil on this candle to attract a doctor that can help my grandmother with her illness? Those all sound like great ways of working to me. How kind of you to want to do work to help your grandmother. And if you scroll up through this thread, you'll see posts from other people who have worked with this saint and get more ideas. to help with passing a nursing exam? Any advice about how to go about this would be greatly appreciated. I have never heard of him being petitioned that way but it certainly is worth a try considering he was a doctor. You would set a candle for him and pray a novia several days. I would add a crown of success mojo, or spell kit to this work, and wear crown of success oil on your head and body.